Christine is the AM coach at Strong Together Hackettstown CrossFit. She started her CrossFit journey back in 2014. She has also been the head JV Volleyball Coach at Whippany Park High School since 2014. Her love of Volleyball lead to her playing four years at Moravian College in Bethlehem, PA, where she received her BA in Graphic Design. It was at Moravian College where she began her coaching career through helping to run Volleyball clinics. It is also in Bethlehem where she began doing CrossFit. 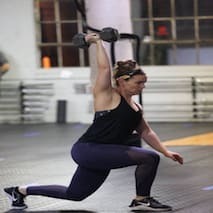 She trained for almost a year in Bethlehem before moving back home to this area where she would join Hackettstown CrossFit and soon intern there as well. Christine loves a heavy Overhead Squat and a nice long AMRAP (as many reps as possible) of Burpees. When she’s not doing CF she’s spending time with her family doing anything outside and competitive. She loves her BOGO cats Kiwi and Clyde. Meet Barry. Barry has been with Strong Together since December of 2015. He joined when he was 72 years old. Most people think that once you hit a certain age, it's too late to get yourself into shape. Barry has never had anything except a go-getter attitude. He makes no excuses, he shows up as consistently as anyone else in our program, and thus, he's seen some of the best results we've had in our facility in almost 4 years. Listen to his Video and you'll understand why he's such a rock star and the things he's accomplished. Some hi-lights would be, 40+ lbs lost, tons of inches from his waist and midsection, off of blood pressure medication, and now on 1/2 of the lowest possible dose of his cholesterol medication. He's able to do push ups without modification, he's run about 1/2 mile without stopping, but most importantly he's functional! At this age we can't overlook the fact that he is simply moving and doing more than many of our own friends and family members who are 10 or so years younger! A true inspiration and a pleasure to work with. Check out his video!